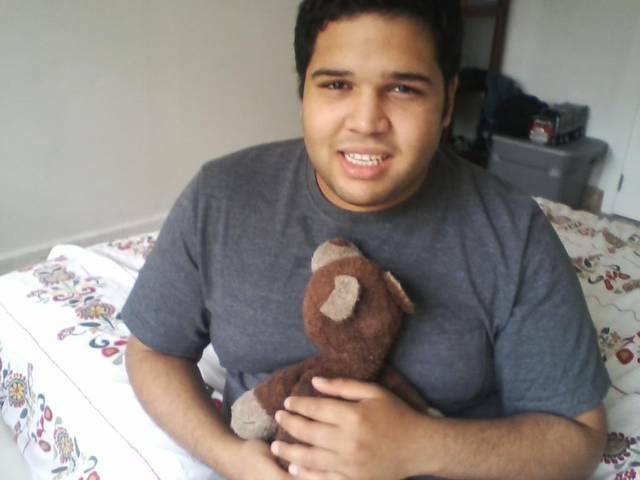 Arnaldo Eliud Rios Soto, the 26-year-old autistic man sitting on the pavement with a toy truck in shock in a viral video could be our son. Arnaldo sat beside Charles Kinsey, his trusted aid, helpless while Kinsey was lying on his back with his hands up, shot, with Miami police surrounding both men 50 feet away. Our son Mustafa has so many similarities to Arnaldo that several people who know our family and have seen Mustafa in person remarked on how much Arnaldo looked like an older version of our son. Like Arnaldo, Mustafa is labeled Hispanic in ethnicity, has an equally lengthy name and heritage, carries the same disability labels although my son carries additional labels to nonspeaking autism and the added stigma of reactions to his name, given in honor of Mustafa Kemal Ataturk and Mustafa's father's grandfather. 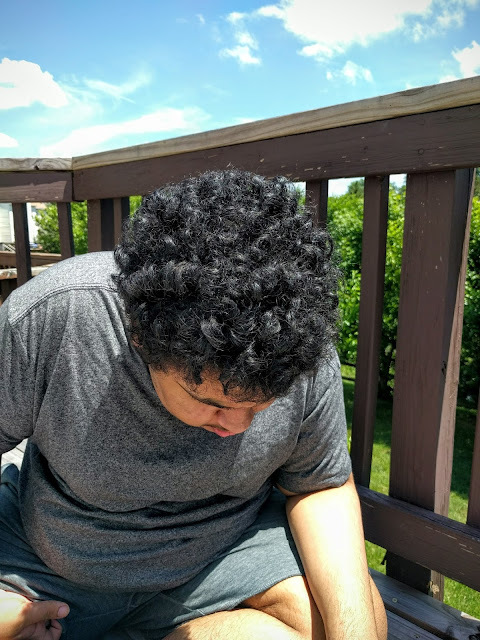 My son's skin is a tan hue that when combined with his curly hair makes it clear he is not what is considered "white" particularly when he is beside me, his Black, Hispanic, Indigenous mother. Like Arnaldo, he loves toy trucks, cars, and construction vehicles. Like Arnaldo, if a series of sirens sounded around him, and men 50 feet away began to shout at him, he would sit where he was, and hold to one of the objects that never leaves his hand because they provide him sensory calm in a world of violent, changing sensory overloads. Mustafa is Arnaldo's peer. Arnaldo's traumatic event, is Mustafa's dilemma, a potentially disastrous event I have fought to find a way to avert since February 27, 2009, the day I was told my son disappeared from the most restricted public school environment. That story still hurts, and I've already spoken of it in bits and pieces like the essay "Afterlife ." Suffice it to say that amber alerts weren't created for missing autistic children. And no amount of police training prevents police who want to believe they need to shoot your disabled son or daughter from taking aim and firing. If the chew tube in your daughter's hand looks like a knife to them, police will shoot to kill first and apologize later even when equipped with tasers and training certificates in autism and disability awareness. Mustafa's dilemma should not exist. His choices should not be to either never be active in his own community or become a target by wanting to participate in it. People ask, as more autistic males of color like Arnaldo Soto and Tario Anderson are traumatized and more Black autistic young men like Paul Childs die, what can be done. 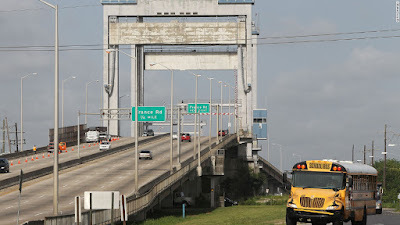 I have been researching the same question since I learned brothers Lance and Ronald Madison were shot for sport on Danziger bridge while Lance was trying to walk Ronald safely out of New Orleans after Hurricane Katrina. Those police officers, who pleaded guilty and were convicted of killing Ronald Madison, had their convictions overturned and were later released. Complete compliance and appropriate behavior make no difference to outcomes. The trigger that sets the stage for the catastrophes is inaccurate or deliberately false 911 calls using three code words: black, male, and weapon. All other parts of the call, words like suicidal, or 'toy' before 'gun,' don't matter. Why have organizational toolkits, rhetoric, photo ops with powerful lawmakers and law enforcement authorities, autism parents who are law enforcement officers training fellow police, and parents with autistic adult offspring rushing to don the "autism expert trainer" mantle failed to stem the tide of harm washing over disabled people of color? A. Everyone has skewed the root cause of the problem. Because the problem is misdefined everyone addresses the wrong areas to solve it. Everyone wants to make the solution a need to train police. Catastrophic encounters with police are an outcome symptomatic of the problem, not the problem itself. What people and organizations are doing is very much like seeing people dying in car accidents because of a manufacturing problem that causes brake failure and blaming it on the car's driver. Elaborate solutions are found for improving driving ability, knowing drivers are not the root issue. Cameras record trip data, engines won't start without seat belts, but the problem is the faulty brakes on certain cars, and everyone wonders, as those selling flawed solutions profit by them, why people continue to die. Neurodivergent people cannot continue to be the drivers blamed for the damaged system that is causing their deaths and traumatizing them. Policing is a community effort. Therefore, the primary route to defining the root cause of catastrophic encounters with law enforcement does not begin at what happens when a police officer meets a nonspeaking autistic person. It begins with asking questions like why, if everyone in Arnaldo's group home was known to the community, a citizen of that community would make a false report to 911 that would deploy armed police to an area where there was no gunman. It continues with why the caller isn't being charged with filing a false police report. Because the community knows the group home, and they know the route taken by group home clients and their care providers when walking. So when we look at each of these incidents, the root cause begins with why police were summoned in the first place, what information they were given, and whether the situation required police, guns, and violent endings. While everyone is lining up to train police departments, no one is training communities to understand and accept neurodivergent community members. Policing is community dependent. Yet no one builds any community to support and include vulnerable community members. Oh everyone has something to say about this, but most never address this because again, we defined the wrong problem, and we are continuing to train police while our people continue to die and become traumatized. Life qualitatively improves for everyone when communities act to truly include and support neurodivergent people . The city of Matsudo, near Tokyo, has built a dementia inclusive community and saved dozens of lives and police resources in the process. Their approach is a potential global model for rebooting communities who must learn to include neurodivergent citizens as the rights to autonomy and community living become as commonplace as they are just. B. Correctly define the root problem, then make workable multidisciplinary solutions at the community and legislative levels. Having now accurately defined catastrophic encounters with police as the end result of the problem and not the problem itself, let's try to state the actual problem clearly. The problem is that communities are uneducated and unaware of how to deal with neurodivergent members exercising their right to active inclusion. Uneducated and unaware communities mean public entities like schools and public access areas as well as those public servants charged with administrating and maintaining them. Structural ableism then intersects with structural racism (and in our son's case, structural Islamophobia) and the toxic result is Mustafa's dilemma. I've stated multidisciplinary solutions in prior articles and interviews. Those proposals include suggested programs to help build peer-run respite centers for those with a psychiatric disability to recover from moments of crises and receive training in interdependence and supports to help them navigate their community. Or hold training sessions for small businesses and community public servants that help make public spaces safe for autistic people to interact with the public with acceptance and understanding. C. Don't erase disabled AAC using, activists of color from being the voices of their own experience. There is an appropriation of neurodivergent voices in advocacy that is just heartbreaking. It is one of the residual tragedies of these events is that those who speak out about them with experience, cultural knowledge, and authority are erased while those who have privilege but no true grasp of what it means to live with Mustafa's dilemma set themselves up as experts and are bolstered, sometimes even provided with grants, to authoritatively discuss issues of racism or ableism without discussing the convergence of racism, ableism, and things like Islamophobia, Transphobia, or structural intolerance of psychiatric disability they cannot begin to understand quite simply because they are not POC who are disabled, AAC users, and survivors of such police encounters. So people who are like my son continue to die while others appropriate the voices of activists who can represent him because they are ASL users, nonspeaking, AAC using disabled adult activists who understand intersectionality and the impact on community barriers to inclusion. Mustafa's dilemma, with its critical high-risk factor of nonverbal communication not being acknowledged by law enforcement officers engaging nonspeaking people, is not addressed sufficiently by disability rights activists who have verbal speech privilege. Its most recent disastrous result was the death of Daniel Harris, an unarmed Deaf community member shot by a police officer while trying to sign to him during a traffic stop. I consider this an escalation, happening because the deaths of POC by police in general, and nonspeaking disabled Black people, in particular, were allowed to continue without accountability and with misguided calls for law enforcement training rather than reform of a militarized police culture even in instances where videos clearly show excessive use of deadly force against unarmed people who were subdued, compliant, restrained, or otherwise unable to inflict harm. D. Create annual, cross-disability, online actions to demand transformative change . I have never seen an annual event that flash-blogs awareness and calls to reform action about the deaths and harm of non-white autistic adults and children in catastrophic encounters with law enforcement. Why is that? I can tell you, dear readers, that one reason is squarely based upon who is dominating the autism conversation in our country. Affluent, white, parents who can keep their own divergent offspring from harm don't see this as an issue until a victim is white or affluent. Excessive use of force against disabled people cannot only matter when the victims are white. Activist across racial, ethnic, and socioeconomic divides should be shouting about injustice as loudly for disabled nonwhite people as we do for white disabled victims. Only this persistent spotlighting by an entire community makes an issue important enough to force lifesaving nationwide legislative change. We need a noninstitutional, community-based infrastructure that can respond to disability and mental health related crises without doing harm to the clients needing supports. This is one answer that arises from the accurately defined problem. Change must be multidisciplinary to dismantle structural ableism and racism. Multidisciplinary change combines community partners at both the grassroots and federal levels who do not normally collaborate to find real solutions to the properly defined problem and lobby together for funding to support those solutions. Things like having our most radical Black Disabled activists be part of task forces with their state and local police chiefs, disabled disability and mental health activists, and families to reduce violence against autistic and other intersected neurodivergent people of color. When I say 'radical disabled activists of color,' I don't mean privileged by way of beginning in poverty and leaving it through education or success - I mean people who are still trying to navigate disability in inaccessible poverty ridden, over-policed communities, are known and respected in those communities for their grassroots activism, and continue to know first hand what Mustafa's dilemma looks like because they actually live it on a daily basis. We individual activists can also start the inclusive community conversation with our own towns and city councils, our own local governments. What national organizations should be doing is presenting this case rather than rushing to stand in line at the police training queue. The less police have to respond to inaccurate 911 calls about neurodivergent people, the less chance of catastrophic encounters. It isn't really their job, you see, to manage disabled people in crisis. It is the responsibility of our entire community to embrace our people. The sooner we cease allowing community ignorance and ableism to keep our loved ones from living as everyone has the right to in this society, the sooner everyone can be part of bringing Mustafa's dilemma to an end. Don't forget- Police officers are NOT mental health clinicians in any capacity. They have an obligation to protect people, but have the responsibility to shoot criminals dead in absolute survival situations. While I appreciate and try to post every comment, I am disappointed in this one because it shows a failure to read the article in its entirety. None of the victims mentioned int the article was a criminal nor were they suspected of committing a crime. The featured autistic witness to a police shooting, whom the officer claimed he was targeting, was the object of a false 911 call about a suicidal adult with a knife when he was in fact someone who regularly walked that route with support staff. Lastly, police in the UK must qualify as trained marksman, and in those rare cases when they shoot suspects in the course of doing their jobs which is to apprehend NOT SHOOT DEAD those suspected of committing crimes, they are trained and required to aim to wound, not kill. The mentality that the police are at war with the public they are entrusted to protect and serve is a very large part of the deadly culture that victimizes marginalized people. Read the article. It never states any expectation of police acting as mental health professionals. It in fact argues that police roles in mental health crises should be reduced or eliminated unless a gun is truly present. It's going to take a long time to educate everyone. There are always jerks even if you do. When disabled person goes missing, police are called. When found, police are called. With drug issues, in many areas, any unusual person viewed with suspicion and in this area, drugs often the cause. Far more often than neuro disability and harmless person. Especially if grown male.